Our standard white and five colors matte label sheet are our most popular and versatile material. It is a bright face sheet with a permanent adhesive. The material produces excellent results when printed with a standard laser printer. The standard white and color label sheets are our most popular and versatile material for indoor use only. It is a bright face sheet with a permanent adhesive, which prints excellent on laser printers. 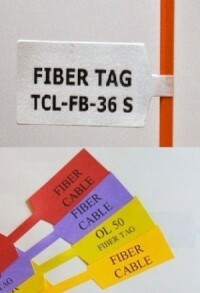 Used for cable tag on cat 5/6 cable and fiber cables. Please note: Each TCL-FB-36 sheet contains 36 Labels. 10 sheets you will net 360 labels, 20 sheets = 720, etc.